It is entirely possible for Africa, as the world’s most promising region in terms of development potential, to bring into play its advantages and achieve great success… The achievement of inclusive and sustainable development in Africa hinges on industrialization, which holds the key to creating jobs, eradicating poverty and improving people’s living standards. So, would it not be in their self-interest that all the European nations join hands with the Chinese Silk Road initiative, and help to reconstruct and build up the economies of Southwest Asia and Africa? I think that that mission would also really help to overcome the disunity of Europe… you will solve that problem by a joint mission for the greater good of mankind. With the Belt and Road Initiative, China has launched an ambitious new global paradigm of cooperative economic development for win-win results, replacing the geopolitical outlook dominant since the death of FDR. This Chinese initiative, coming after decades of organizing by Lyndon and Helga LaRouche and the Schiller Institute, represents a major victory, and is producing clear results, such as the modern rail projects in Kenya and Djibouti–Ethiopia, financed by Chinese state banks. Extending the New Silk Road to West Asia and Africa covers these developments, and, more importantly, advances proposals in the fields of economics, infrastructure, science and space, transportation, power, water, finance, agriculture, and more—proposals needed to bring the potential to the next stage. Global media coverage of Africa and the Middle East (or, rather, Southwest Asia [FN 1]) typically focuses on war, terrorism, famine, epidemics, and mass immigration. Very seldom are these two regions associated with economic development, scientific breakthroughs, or cultural advancements. Unfortunately, this image of the region has a substantial basis in reality. The situation does have domestic causes, but is also largely related to global geopolitical factors and the attempt by major global powers to secure spheres of influence, natural resources, markets, and strategic and political advantages against other global and regional adversaries. But, the purpose of this report is not to dwell on all the ills that have contributed to this reality (something that the authors of this report and their associates have extensively dealt with in other publications). Rather, our mission here is to find and show the way forward out of the current, admittedly very dangerous, situation. The good news is that a new paradigm in world politics has emerged, and is concretely changing the rules of the game of what can be called the old paradigm—the paradigm responsible for the above-mentioned problems in West Asia and Africa. 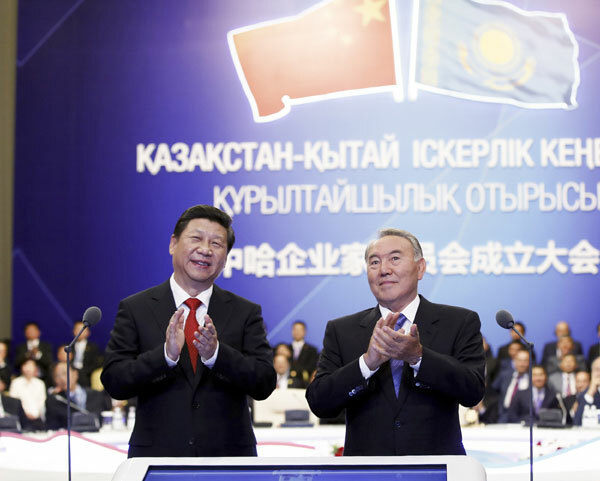 The announcement of the One Belt, One Road Initiative (or Belt and Road Initiative—henceforth referred to as BRI) by Chinese President Xi Jinping in late 2013,[FN 2] which was a breakthrough for the New Silk Road policy adopted by China since 1996. President Xi’s initiative transformed the policy into a global strategy backed by the massive financial, technological and political power that China had developed in the previous 20 years of fast-track industrialization, hinging on the construction of infrastructure mega-projects whose scale had not been seen in the world since the U.S. New Deal before World War II, the post-World War II reconstruction of Germany, and the U.S. space program of the 1960s. 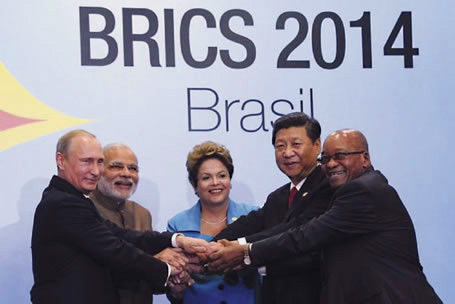 The July 2014 Fortaleza Declaration by the BRICS nations (Brazil, Russia, India, China and South Africa). [FN 3] This declaration cemented the economic and financial cooperation among these nations, envisaging the joint creation of new financial institutions, such as the New Development Bank, that are almost solely focused on development of infrastructure, trade, industry, scientific cooperation and research. What these nations, especially China, have proven, is that eliminating poverty, famine, and disease can only be achieved by full-scale industrialization and the utilization of state-of-the-art technologies to unleash the creative, productive powers of society, as the United States and Europe had done in previous centuries, and not by piecemeal small steps, as the United States and Europe have been proposing for Africa and Asia since at least the 1960s, or by “humanitarian,” emergency aid, for example, which has become the rule, rather than the exception in dealing with Africa. The BRICS nations, with China foremost among them, have even redefined what was called “sustainable development,” using the phrase to mean industrialization, food security, and the eradication of poverty, rather than adjusting the living standards of people to immediately available resources and technology. Technological apartheid had for many years been a policy practiced under various excuses by industrial nations, preventing developing nations from acquiring advanced technologies. Now, the BRICS nations, led by China, are breaking that “rule,” making advanced technology available for nations in Asia and Africa. These developments come as the western world has entered into the worst financial and physical-economic crisis since the Great Depression, weakening its ability to resist and to undermine the rising economic power of the BRICS, a response that would be expected based on the geopolitical trends of the past. Although seen as a challenge by many in the crisis-ridden, formerly industrialized nations, or the OECD nations, living within what can be called “the old paradigm,” the new paradigm is in reality an inclusive process, not an exclusive club of developing nations. The United States, the European Union (EU), and Japan are frequently invited by China, Russia, and India to join the process of development that the latter nations are involved in, both within their own territories and around the world. The May 14-15, 2017 Beijing Belt and Road Forum for International Cooperation,[FN 4] was the proof of success of the Chinese policy of transforming the New Silk Road policy into a global phenomenon and an international strategy for peaceful cooperation and growth. 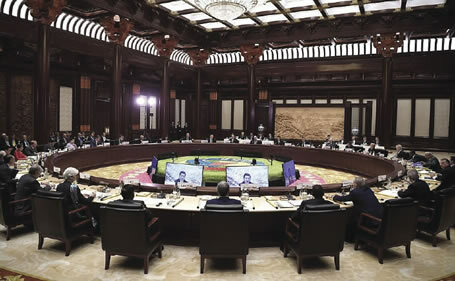 The summit was attended by 29 foreign heads of state, government officials from more than 130 countries, 70 international organizations, and over a thousand delegates. Included among the attendees were the Chairwoman of the German Schiller Institute, Mrs. Helga Zepp-LaRouche, and other representatives of the Schiller Institute, including the two members who researched and authored this report. First, we should build the Belt and Road into a road for peace. The ancient silk routes thrived in times of peace, but lost vigor in times of war. The pursuit of the Belt and Road Initiative requires a peaceful and stable environment. We should foster a new type of international relations featuring “win-win” cooperation; and we should forge partnerships of dialogue with no confrontation, and of friendship rather than alliance. The BRI is based on the solid foundation of China’s own economic miracle in the past few decades. It has evolved from a national Chinese project of economic development and industrialization into a massive intercontinental initiative for connectivity and economic cooperation, an initiative that more than 60 nations have joined so far, and that can potentially become the biggest economic undertaking in the history of mankind. West Asia and Africa, which enjoy massive geographical advantages and human and natural resources, are poised to reap major benefits from this global initiative. The fact that China is sharing its amazing experience of industrialization and development of the past three decades with the rest of the world is a key element of success. China lifted 600 million of its citizens out of poverty between 1981 and 2004—as attested by such institutions as the World Bank[FN 6]—through investments in urban and rural infrastructure projects, and mega-projects in transportation, water and power. This is an unparalleled achievement that can be replicated in the Middle East and Africa. Within this 23-year period, China built more water management projects than the United States had done in a hundred years. Another amazing indication of this feat is that China used more cement in the three years 2011-2013, than did the United States during the entire 20th Century! [FN 7]China’s 11,000 km high-speed railway network (which is planned to reach 20,000 km in the next decade), has already surpassed the combined network of the Western European nations. China has 37 operating nuclear power plants (70% of which were built in the past decade alone), and a further 20 plants are under construction. Through the BRI, China is offering the rest of the world its know-how, experience and technology, backed by a $3 trillion financial arsenal. This is a great opportunity for West Asia and Africa to realize the dreams of the post-World War II independence era, dreams that have unfortunately been sabotaged for decades. The dramatic deficit in infrastructure both nationally and inter-regionally in West Asia and Africa can, ironically, be considered in this new light as a great opportunity. Although many other industrial nations in Europe, Asia and the Americas have technological and labor capabilities similar to those of China, they lack the vision and political will to apply these capabilities and to finance their use. Since West Asia and Africa combined is such a strategically important area for both East and West, it is, therefore, a perfect place for bringing the capabilities of the nations of the world into one concrete project of peaceful cooperation and development. 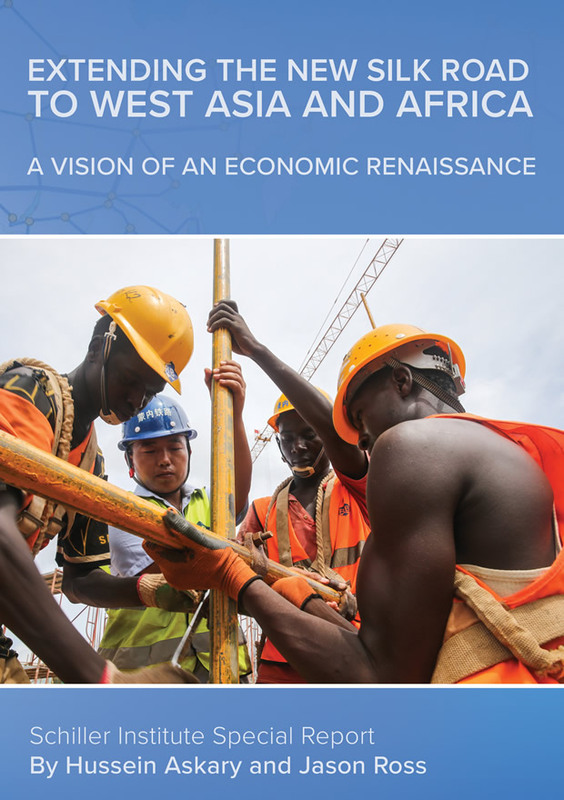 Encouraging signs have simultaneously emerged from African nations that have realized the importance of joining and benefiting from the new paradigm of development based on industrialization and large-scale infrastructure projects. Egypt and Ethiopia, for example, have both designed impressive national development plans that are being implemented in rapid steps. But even here, especially in Ethiopia, China’s role is decisive. Breaking with the idea of technological apartheid, President Xi declared that “China is ready to share, without any reservation, advanced applicable technology with Africa and to combine Chinese competitive industries with African needs for development to deepen industrial cooperation.” He also promised to open vocational centers in Africa for training African personnel. Thus, the stage has been officially set for one of the greatest endeavors in human history. 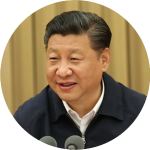 President Xi usually uses the description that programs of development proposed by China “will be open and inclusive, not exclusive. They will be a real chorus comprising all countries along the routes, not a solo for China itself.”[FN 13] The usual skepticism expressed in discussing China’s intentions behind the BRI strategy is partly motivated by a sense of rivalry and fear by those who harbor the typical geopolitical notions inherited from centuries of imperialist rivalries, colonialism, and slavery. Ironically, these notions are also shared by the victims of these evils, who view every major power as an egoistic force whose only concern is to take, and never to give or to collaborate. On the other hand, a great deal of this skepticism is based on ignorance of China’s culture and of its historical characteristics. These two matters have been thoroughly addressed, not by a Chinese, but by a European personality with the most knowledge of, and personal involvement in this Chinese initiative in the Western world. That is Mrs. Helga Zepp-LaRouche, a German citizen, founder and chairwoman of the international Schiller Institute, and wife of American economist and statesman Lyndon LaRouche. 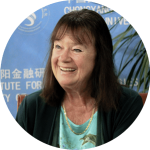 Her 40-year involvement—in collaboration with her husband and associates in the Schiller Institute around the world—in defining the principles and propagating the importance of connecting all the continents of the globe through infrastructure and development corridors, has gained her the nickname “New Silk Road Lady” in Chinese media. Zepp-LaRouche stated that her extensive studies of China since her 1971 visit—as one of the first Western journalists to go to China in the middle of the Cultural Revolution—show that these claims are not true. “I have seen China as it was then; I traveled to Beijing, Tianjin, Qingdao, Shanghai, and to the countryside, and so I know what an enormous transformation China has made in this period,” she said. man is good by nature. 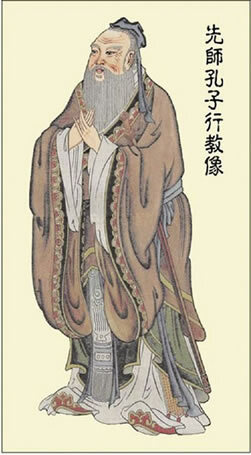 The key notions of the Chinese philosophy are ren, which is the idea corresponding to “agapē”—love, charity in the Christian tradition; and the idea of li, meaning “principle,” which is the idea that if each person and each thing develops in the best possible way, you have harmony in society. This corresponds to the idea of Cardinal Nicolas of Cusa (1401-1464), that if each microcosm develops in the best way, you have concordance in the macrocosm; or the idea of the monad of Leibniz, that if each develops his fullest potential, you have harmony. There’s also the idea that there is such a thing as the Mandate of Heaven: that there must be harmony between nature and man, and this comes originally from the idea of God’s will of the Western Zhou dynasty, from BC 1046-771, which said that there must be harmony between the heavens and man, and that they are closely related. Harmony without uniformity is what Confucius writes about in his Analects. Unity in diversity is the idea as expressed by Nicholas of Cusa. In the Book of Rites, which is the preface to the Great Learning of Confucius—it’s attributed to him—he writes: “Now, harmony in society and among nations is based on an understanding of the principles of things.” This is the same idea Friedrich Schiller (1789-1805) has in his Letters Upon the Aesthetic Education of Man, that only scientists and Classical artists understand the truth. Therefore, this new model of cooperation among nations is not a utopia, but a vision of the future. The closest thinker in the European philosophical tradition to Confucius, Nicolas of Cusa, created an epochal new philosophical approach, which really separated the Middle Ages from modern times. He said the principle bringing about order and wholeness, the idea of concordance, of a universal concordance in the universe, is that harmony is not an aesthetic thing, but that in a contrapuntal way, the different microcosms must develop each other to the fullest, to the benefit of the other—the “win-win” idea; also the principle of the Peace of Westphalia (1648). The negative paradigm shift that took off in the early 1970s in the United States and Europe, ushered in with the official takedown of the Franklin Roosevelt-era Bretton Woods system beginning under the Nixon Administration in August 1971, created a chain of financial and debt crises in the 1980s and 1990s around the globe. The focus shifted away from the state-financed industrial development policies that made possible the 1930s recovery from the Great Depression in the United States, and enabled Europe to recover from World War II. The new tendencies towards deregulation of financial and credit markets and towards globalization, made financial and monetary gains the primary criteria for investment. The creation of ever-greater financial bubbles and derivatives bubbles became the key element of financial practice, and public investment institutions and private resources moved gradually into the financial sector which promised ever greater profits on purely financial tools and products rather than physical economic development. These neo-liberal policies found a suitable ally in the environmentalist movement, which was opposed to large-scale, modern industrial development, and the two worked hand in hand to prevent governments from financing large-scale infrastructure, industrial expansion, or scientific projects. The focus shifted simply to maintaining what was previously built and to building ever smaller projects. Developing nations became unable to receive credit and technologies from the industrialized sector to pursue their development goals, becoming more and more addicted to emergency aid and economic assistance programs. Instead of building dams, and water and sanitation systems, African nations were offered mosquito nets to fight disease, and were offered contraceptives to reduce birth rates, rather than help to build a modern health care system. As will be shown in the relevant sections of this report, investments in infrastructure create value far beyond any direct monetary profit to the investors. These investments are meant to raise the productivity of the individual and society as a whole, wherein the real wealth creation process lies. Mega-projects are transformative in nature, creating a great chain of developments. 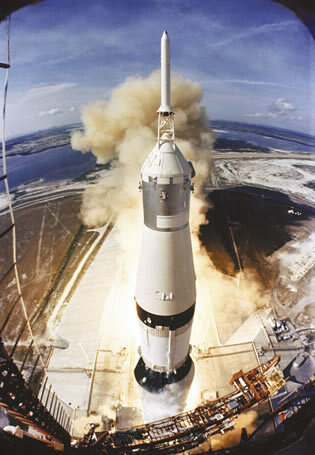 And they are technology generators, forcing the expansion of technological capabilities beyond current boundaries, as they pose new types of problems for society to solve—as seen in the fantastic advances made in achieving the goals of the U.S. Apollo space program in the 1960s. The mega-projects that survived the economic downturn of the industrialized sector are singularities, remarkable for the general infrastructure void in which they have been completed. Such projects, completed against great financial odds and environmentalist resistance, are usually driven by necessity, such as solving traffic problems between regions, rather than as part of a larger national and regional economic plan. Examples include the Vasco da Gama Bridge in Lisbon, Portugal (completed in 1998), the Øresund Bridge/Tunnel between Denmark and Sweden (completed in 1999), the “Big Dig” Central Artery Tunnel Project in Boston, USA (1991-2007), the Incheon Bridge in South Korea (completed 2009), Spain’s national high-speed railway network (built 1992-2016), and the Gotthard Base Tunnel in the Swiss Alps (completed in 2016). Otherwise, when it comes to the past two decades, China tops the list of such projects and is contributing to similar projects abroad. However, such overseas infrastructure projects invested in by China are part of a larger development process, not objects in and of themselves. This has to be taken in consideration when planning the development of West Asia and Africa, as will be explained in the chapters of this report. As will be shown in Chapter 3, the notions of “limited natural resources” and the so-called “carrying capacity of the ecological system” are not applicable to human society, since it is the level of scientific and technological progress which defines the range of “resources,” rather than an a priori “natural” limit. Therefore, adopting the “sustainable development” goals determined by such notions as in the Brundtland Report poses a great obstacle to eliminating poverty and providing higher living standards and quality of life for all individuals and nations. We need a new definition of these notions, or completely different concepts. China has proven that the way out of poverty and onto the path of progress is through fast-track “industrialization” and large-scale development projects and mega-projects, using the full range of resources, whether scientific, human, or natural. For example, all useful sources of energy, such as coal, oil and gas, hydropower and nuclear power must be used. While it is imperative that the sources of power with a greater energy-flux density, like nuclear fission and fusion, should replace the less dense sources, it is neither reasonable nor moral to ask poor nations to avoid the sources of power that enabled the United States, Europe, Japan and others to become modern industrial societies. China’s economic miracle is based on implementing sound policies that seem to be the opposite of those demanded by such international institutions as the World Bank, the IMF, international environmental organizations, and financial consulting corporations and think tanks. China has followed a policy which was, ironically, the policy that made the U.S. the greatest economic power on earth by the end of the 1940s, and made a ruined Germany the second greatest industrial power in the post-World War II world. This discrepancy—between the proven, successful methods of development, both current and historical (as in industrialization of the United States and Germany, for example) on the one hand, and what is being promoted by international institutions on the other—must be cleared out and eliminated. The new paradigm of development spearheaded by China and the BRICS nations is a key element in this process. It is therefore necessary to state in clear terms here, in this context, that the definition of the term “sustainable development” should mean the ability to “maintain” a process of providing ever higher standards of living, both physically and culturally, to whole societies through scientific creativity and technological innovation. “Sustainable development” should not be used to mean the adaptation by society to an ever-shrinking base of fixed resources, because there is no such a thing as limited resources! What puts a limit to growth is the lack of cultural, scientific and technological progress. One the biggest obstacles in the way of establishing equitable partnerships between Africa on the one hand and Europe and the United States on the other, is that, while in the colonial period Africa was considered a mere looting ground, in the post-colonial era, Africa continued to be considered as a source of raw materials, but was also increasingly regarded as a burden that could only be helped by “relief” and “foreign aid” rather than cooperation to build the means by which African nations could become self-reliant to meet their economic and social needs. Where Europe and the United States see only problems, China sees potentials and opportunities. Such positive thinking is not limited to China. U.S. President Franklin Delano Roosevelt (FDR) had a similar view of Africa. FDR—who rescued the U.S. economy after the Great Depression hit, and helped rid the world of Fascism and Nazism during World War II through using U.S. industrial and logistical capabilities during his New Deal economic revival years in the 1930s—held very strong anti-colonial sentiments and views. 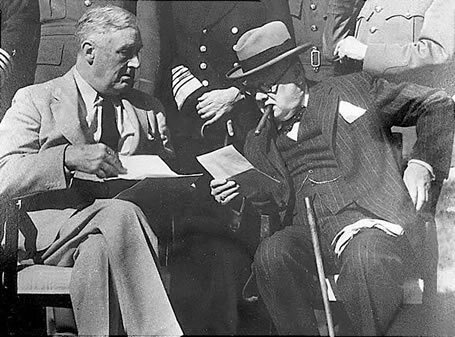 His heated encounters with British Prime Minister Winston Churchill, documented by his son Elliott Roosevelt, a U.S. Air Force officer who at times accompanied his father to international conferences during the war,[FN 21] attest to his vision of what should have happened after the war. Unfortunately, FDR died before the war ended, and his successors did not follow up on his progressive views and policies. There had been no such African document since Senegal’s Cheikh Anta Diop, in 1960, published his passionate vision of creating “a powerful State industry, giving primacy to industrialization, development, and mechanization of agriculture,” with nuclear power production and technical institutes in such fields as nuclear physics and chemistry, electronics, and aeronautics (see Chapter 9). 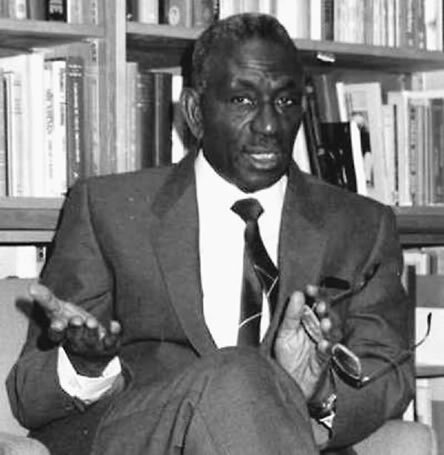 Senegalese scholar and scientist Cheikh Anta Diop in 1960 called for industrialization, nuclear power, and the highest levels of education. Economic integration, coupled with infrastructure development, saw intra-Africa trade mushrooming, from less than 12% in 2013 to almost 50% by 2045. This integration was further consolidated with the growth of commodity exchanges and continental commercial giants. Starting with the African pharmaceutical company, Pan African companies now not only dominate our domestic market of over two billion people, but they have overtaken multi-nationals from the rest of the world in their own markets. My friend, Africa has indeed transformed herself from an exporter of raw materials with a declining manufacturing sector in 2013, to become a major food exporter, a global manufacturing hub, a knowledge centre, beneficiating our natural resources and agricultural products as drivers to industrialization. Pan African companies, from mining to finance, food and beverages, hospitality and tourism, pharmaceuticals, fashion, fisheries and ICT are driving integration, and are amongst the global leaders in their sectors. We are now the third largest economy in the world. As the Foreign Ministers’ retreat in Bahir Dar in January 2014 emphasized, we did this by finding the balance between market forces and strong and accountable developmental states and Regional Economic Communities (RECs) to drive infrastructure, the provision of social services, industrialization and economic integration.
. . . [T]he African Express Rail now connects all the capitals of our former states, and indeed they will be able to crisscross and see the beauty, culture and diversity of this cradle of humankind. The marvel of the African Express Rail is that it is not only a high-speed train, with adjacent highways, but also contains pipelines for gas, oil, and water, as well as ICT broadband cables: African ownership, integrated planning and execution at its best! A flagship project of this vision, the African Express Rail, renamed the African Integrated High Speed Railway Network (AIHSRN) project, was initiated six months later at the AU Summit by the AU Executive Council. The context of this exciting development is to be found both in Africa and China. 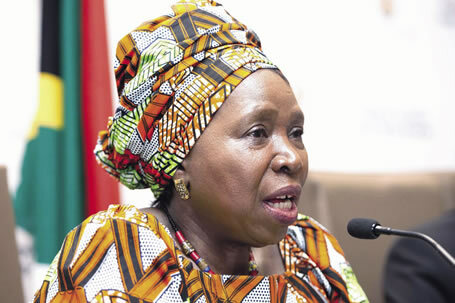 Dlamini-Zuma had become chairperson of the AUC in 2012 and, having been South Africa’s foreign minister from 1999 to 2009, she already had strong ideas about what direction Africa should take. Xi Jinping had become President of China in 2012 and had already developed his concept for a New Silk Road. When Dlamini-Zuma and Xi met in Beijing in February 2013, it was a meeting of two minds. In May 2013, the vision whose formulation she was leading, called Agenda 2063, was discussed by the AU Assembly of Heads of State and Government (AU-AHSG). Her “Email from the Future” followed in January 2014. 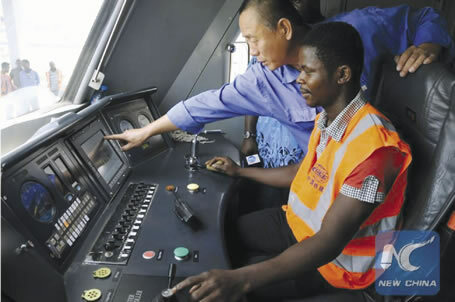 In May 2014, Li Keqiang, Premier of China, visited the AUC in Addis Ababa as part of a broader tour of Africa, and pledged “cooperation between Africa and China in high-speed railway, aviation, highways, and industrialization infrastructure,” and included in that cooperation the project to connect all African capital cities with high-speed rail. After the Agenda 2063 Framework Document was adopted in September 2015 by the AU-AHSG, Dlamini-Zuma, at the invitation of Foreign Minister Wang Yi, went to Beijing in November for a six-day visit, to take Africa-China cooperation forward. 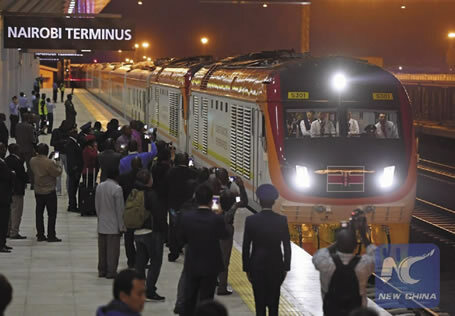 She rode on the Beijing-Tianjin high-speed train for the first time, accompanied by Ambassador Kuang Weiling, the head of the new, permanent mission of China to the AU, established at AU request. Her ride on a high-speed train was symbolic of one of the underlying principles of Agenda 2063, that Africa must proceed by leap-frogging to the most advanced solutions and the most advanced technologies. Some in the West say that African development should be through “appropriate technologies,” that an incremental approach to improvement should be taken, that foot-powered treadle pumps for water, or solar panels on huts would be a useful upgrade. This outlook must be rejected. Instead, Africa should have the best and latest technologies, and the greatest ambitions not only to pull its peoples out of poverty and underdevelopment, but to move them to a completely new economic platform. 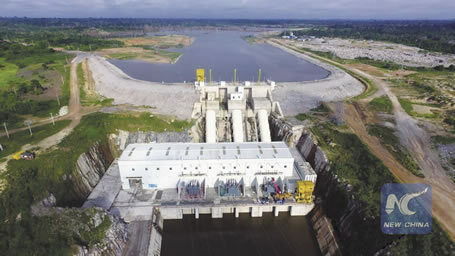 The Congo River, for example, could support the production of an estimated 100 GW of hydroelectricity, enough for hundreds of millions of people, with 40 GW from the planned Grand Inga Dam alone. The Transaqua water transfer program—which would use a small fraction of the water from the Congo and its tributaries to refill Lake Chad, provide a navigation means in Central Africa, and generate great amounts of hydropower—would be larger by an order of magnitude than any other water project in the world (see Chapter 6, Transaqua: The Centerpiece of African Development). The expansion of rail lines in Africa is currently at a world-leading level. New transportation routes across Africa will connect the hinterlands to the cities and ports, allowing modern development. With access to efficient transportation, regions benefit from opportunities to bring in equipment and supplies, to export their products, and for residents to travel. With the availability of electricity, higher productive capabilities are unlocked, and the value of the land and the people increases. Incredible potential for growth exists in Africa and West Asia! This report will explain projects that are proposed and those underway, make proposals for a new level of connectivity and economic infrastructure for the region, and discuss the economic outlook and financing required to bring these programs to life. However, before any proverbial shovels dig into the ground, a complete intellectual review is required to clear and overturn some dangerously false but generally accepted axioms and postulates regarding the human species’ relationship to and its role in nature, what “resources” are, how societies develop, how development is financed, and the proper role for industrialized nations in West Asia and Africa. There are many such axioms and concepts that are treated almost as law or divine revelation, but they have been partially responsible for Africa’s current state of poverty and lack of development, and they form a great obstacle to reversing these conditions. These will be dealt with in Chapters 3, 4 and 5. The authors prefer not to use the term “Middle East” for two reasons: 1. It is not a scientific term, because geographical regions should be divided into subsections of continents, and not into regions seen from the visual or political perspective of one part of the world or another. Therefore, the correct term to be used to designate this region is “Southwest Asia” or, for the purposes of this report, “West Asia”; 2. The term “Middle East” is part of the legacy of the British Empire, and was coined by the British India Office in the 1850s, to distinguish the different “properties” of the Empire as they were geographically imagined from London’s perspective. See Beaumont, Peter; Blake, Gerald H.; and Wagstaff, J. Malcolm, The Middle East: A Geographical Study (1988).